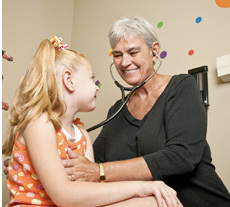 We’re a group of family physicians who take care of your whole family, from newborns to seniors. Our group of providers specializes in several areas including pediatrics, geriatrics, minor dermatology problems and sports medicine. Caring for patients through every stage of life. best choice for your particular issue. We communicate with these specialists and once you’ve signed off on the permission form, we can share your pertinent medical records with these specialists to make sure you receive the proper care. Just like you, our physicians and their families are members of this community. We consider it an honor that you’d choose to share your family with ours.